The Kelly Criterion is a method of relating the odds of an outcome to the edge that traders are always attempting to create for themselves by having a strategy. The OmiCronFX Mandelbrot algorithmic routine is an automated Forex trading strategy, and it has an edge built in. To apply the Kelly Criterion analysis, we assume that the odds represent the record of profitable trades as a percentage of all trades, while the edge is the cash value of all profitable trades divided by the cash value of losing trades, over a certain period. This exercise has been carried out in the illustration above for all real-time trades that took place in the last two weeks of July 2015, when Mandelbrot was configured to take trades going in both directions on the EURUSD currency pair - those that were long (expected the Euro to rise against the dollar) and those that were short (expected the opposite outcome). When the data was gathered and the numbers were crunched, the Kelly Criterion was applied to the outcome. 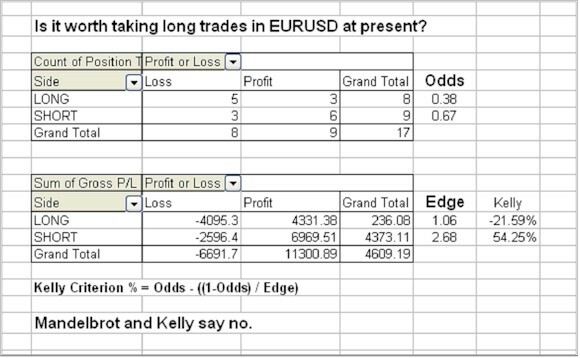 It turns out that the Kelly percentage for long trades was a negative number, while the corresponding value for short trades was a respectable 54.25%. The rules of the Kelly criterion state that when the percentage is negative, no trade should be taken. So even though in our case there was not a money loss on long trades over the period, it was not worth while taking long trades. The risk of loss was too great. That remains the case. The bears are firmly in control of the EURUSD pair (bears always go short and bulls always go long). This is a powerful tool for deciding on day to day trading decisions. When this exercise is carried out on a daily basis on, say, the previous fourteen trading days, in the same way that a moving average is calculated, the trend in the Kelly percentage for long and short will be a clear indication of whether the bulls or the bears are in the ascendency, while a comparison of them will tell whether the tendency is changing from long to short, or vice-versa. 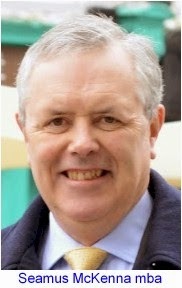 Using the Mandelbrot algorithmic routine and the Kelly Criterion means that the analysis is carried out in a systematic, mathematical fashion. This gives confidence to the results.